STEM; Building with squares. 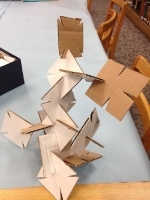 Make really cool structures from cardboard. Kids can challenge themselves to build the tallest structure possible using 15 squares, or the longest bridge possible using 15 squares,.Build a structure that looks like a tree or animal. Use your imagination. Once you are happy with your structure, paint it and take it home!